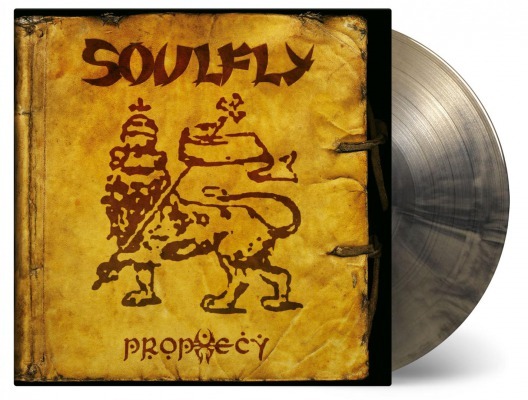 SOULFLY - PROPHECY COLOURED VINYL (LP) | Online Shop | Wizard LTD. Album: "PROPHECY COLOURED VINYL (LP)"
The American metal band Soulfly is led by former Sepultura frontman Max Cavalera. Prophecy is their fourth album and consist of world music influenced songs. During the time Cavalera spent in Serbia he began to get impressed by spiritual themes. He recruited a new line-up, including David Ellefson of Megadeth and Bobby Burns of Primer 55 on bass guitar and Marc Rizzo, formerly of Ill Niño, on guitar. The album is heavy and got some riffs that remind us of his time with the band Sepultura. The introspective songs sounds more like a fusion between metal, dub and tribal. It’s an album with different faces, which makes it a real Soulfly album. Soulfly is formed in Phoenix, Arizona in 1997 by Sepultura frontman Max Cavalera. Their combination of Brazilian tribal sounds, world music and metal makes them unique in the contemporary music scene. Prophecy is available on vinyl for the first time as a limited edition of 2.000 individually numbered copies on gold & black mixed coloured vinyl. The package includes a 12 page booklet.